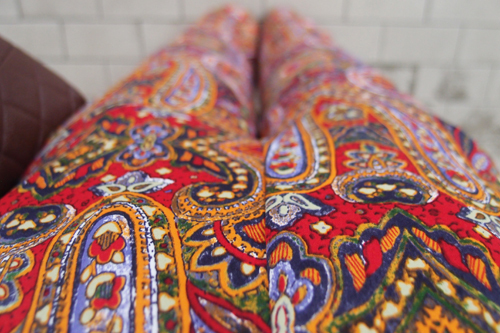 Ok so I started with prints on my pants. And I didn’t think it was so bad. I know the trick is to pair it with plain items; printed top, plain bottom, vice versa. But because I have another piece of cloth on me wrapping my head, it gets a bit tricky there. The safest way is to go for a plain headscarf obviously (like I did here), but I’m really trying to see if I can be less boring, bend the rules a bit and get away with print on print. We shall see… I shall experiment and share (if I don’t share, that means I looked like a goon in it). For now, I present to you the first proper print I’ve worn ever since donning the headscarf. Naturally, I chose Mimpikita, a brand close to my heart. 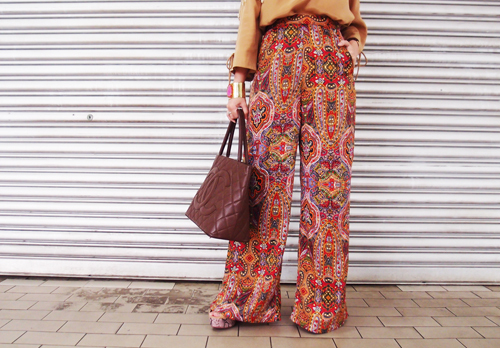 Wearing pants from Mimpikita, ribbon top from FV for Downy (I’m finding it awesome as a basic top tucked in), heels from Kiss & Tell <3 FV, bangle from Coffee&Covet & Hermes, headscarf from Mukaa and my mom’s Chanel bag that has lived in my house for a year now therefore is mine. One of my pet peeves is grammatical mistakes. Which is why I freak out searching for a laptop when my friends tell me I spelled something wrong on my blog. But yeah, I will point out anyone who types to me wrongly especially on our FV group chat. I’ll also scold them for typing emails with grammatical errors to people outside FV. They call me the Grammar Police, I think I’m starting to annoy them. Haha. Whenever I make English errors myself, they have a party in the office. BUT in all seriousness, I think it says a lot about the company if their emails are proper and with good grammar. Shortforms are no-no’s unless you’re really close to the third party already. And a single word “noted” in an email is just rude. Email etiquette 101! Anyway, “pintu ini di tutup sementara” should really be “pintu ini ditutup sementara”. Tutup is not a place or a direction. Tutup here is a verb. OMG Vivy ! Your Chanel’s bag looks totally the same as my mum’s. And, it has been about 20 years now. I thought I would never see those design from Chanel again.